These plates are unusual, decorated with coloured foil on glass plates. They measure 7.5 inches in diameter. Decorative ceramic wall plates, Blue/White, Large, with Hangers, good make. A Decorative Wall Plates, two, size is 10" Dia. Nice for Kitchen Display, with hanger's, one slight chip on underside carn't see on wall. decorative wall plates. Beautiful colours in mint condition. From smoke and pet free home. Dispatched with Royal Mail 2nd Class. 2 Hutschenreuther Limited Edition Decorative Hanging Wall Plates 10"
2 Hutschenreuther German Porcelain Decorative Hanging Plates. Plates are 25cms (10") across. Large size from 1989 and1990, both numbered limited editions with artists signature Ursula Band. Vintage Blue & White Porcelain Decorative Plates,Wall Hanging,Plaque,Home Decor. vintage decorative wall plates. Condition is Used. Very old plate so a few age cracks and lines plus chip on back as shown but nothing on front at all. Dispatched with Royal Mail 2nd Class. Stunning Moroccan Inspired Canvas Wall Art Picture. Large Size Canvas. DUCK PLATES. Wall Hanging Decor. Delightful ducks in the middle. Good condition. 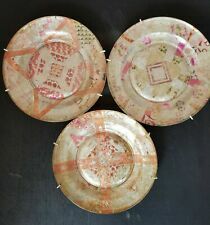 3 decorative wall plates all in good condition. 2 Heavyweight Ceramic Wall Hanging Embossed Plates depicting country scenes. Both in good condition no damage but some age related crazing to the glaze. Check out my other items I'm happy to combine postage 2 x Decorative wall Plates Showing Jerusalem On It - Colorful And Pretty pottery. Condition is Used. Dispatched with Royal Mail 2nd Class. Vintage Decorative Wall Hanging Plate Cottages Scene. Condition is Used. Dispatched with Royal Mail 2nd Class. Spanish Ceramic Decorative Wall Plate With large blue flowers, Hand made, Hand Painted. 180mm. Condition is Used. Dispatched with Royal Mail 2nd Class. New listingSet Of 6 Coalport Fine Bone China Owl Decorative Ornamental Wall Plates 8.5"
Set of 6 Coalport ornamental plates measuring 8.5" with owl designs. 5 Of the plates are boxed and one is not but all are in good condition. Please take a look at the photos to see the designs. One plate has strawberry's on and the other has peaches. Both plates have a gold rim. This is ideal for any collector of these wall plates. 2 DECORATIVE WALL PLATES. Condition is Used. Dispatched with Royal Mail 2nd Class.